Tom's Terrific tangerines are a medium to large variety with a deep orange, glossy skin. They measure an average of 8 centimeters wide and 6 centimeters tall with a slight wrinkling at the neck and a flat bottom. The texture of the rind is pebbled and leathery, and it easily peels away from the flesh. The seedless pulp is juicy and sweet with a balanced rich, tart flavor. Tom's Terrific tangerines are available late winter through spring. Tom's Terrific tangerines are exclusively grown by Polito Farms in Valley Center, California. They were first grown as a part of trials in collaboration with the University of California Riverside's Citrus Program. They are botanically classified as Citrus reticulata and are the result of an intentional cross between a tangor and two mandarin varieties, originally called “TDE4”. Those familiar with Tom's Terrific tangerines affectionately refer to them as "Triple T's". They got their name when Bob and Mary Polito's son, Tom, was tasting one of the new tangerines for the first time and said, "These are terrific!" Tom’s Terrific tangerines are high in vitamins C and A, dietary fiber and potassium. They are a good source of calcium, phosphorus, and beta-carotene, and are high in antioxidants. Tom’s Terrific tangerines can be eaten raw, juiced, or cooked. They peel easily and make an easy snack or quick dessert. Add peeled segments to green or fruit salads. Use the zest and juice in beverages and baked goods. The juice can be used in marinades, sauces, and dressings or for making curds, panna cotta or sorbet. Store Tom’s Terrific tangerines at room temperature for a few days, refrigerate for up to two weeks. Tom’s Terrific tangerines were featured as an ice cream flavor made by Los Angeles’ Rose Creamery who served it up at Mendocino Farms pop-up event in La Jolla in February of 2017. Polito Farms was featured as one of the creamery’s sources for local ingredients. Tom’s Terrific tangerines were first introduced to the San Diego area around 2007. They were initially one of three varieties developed by the University of California Riverside’s Citrus Breeding program in 1973, from an intentional cross between a temple tangor and dancy and encore mandarins. The commercial appeal of the three mandarins, called TDE2, TDE3, and TDE4 wasn’t realized until the late 1980s and trials began shortly thereafter. Budwood for TDE4 was eventually released in 2002 to growers and wholesale nurseries through the Citrus Clonal Protection Program. Polito Family Farms in northern San Diego County planted several acres of the new TDE4 variety. 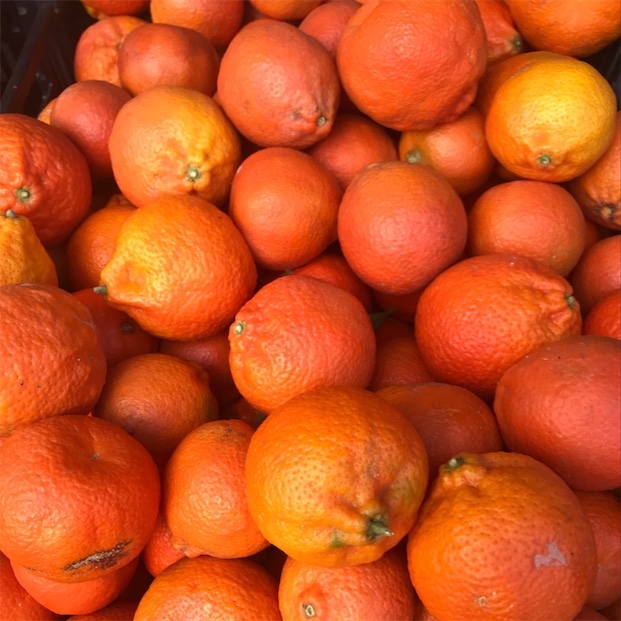 The fruit from those trials was named Tom’s Terrific, after Bob and Mary Polito’s son, and have become a popular late winter tangerine at farmer’s markets where Polito Farms sells their fruit. Tom’s Terrific tangerines are also sold wholesale to restaurants and hotels in San Diego County. Someone shared Tom's Terrific Tangerines using the Specialty Produce app for iPhone and Android.